This is the kind of show that was electric before it even began. Hell, before half the crowd were even in their seats, people were cheering. The crowd was comprised with a healthy mix of ex-emo kids and Kombucha Boys, a pretty standard crowd for a Vancouver gig. I will say, I was a little hesitant of the venue. Don’t get me wrong, I adore the Orpheum. It’s gorgeous and the acoustics are incredible but for a tour labeled ‘Dance & Cry’, it seemed like an odd choice. The lights went down and opener’s Said The Whale walked on stage without much fanfare. That is until they started playing. They launched into one of their more notable tracks, Camilo. I will say, that song isn’t one of my favourites but it absolutely rocked. They played with high energy yet a low-key attitude. Pretty Vancouver-esque, I would say. It was a double whammy performance for Said The Whale. Not only was it a hometown show, it was also the night before their new album, Cascadia, was released into the world. They played a few tracks from the upcoming album as well as explaining the meaning. For example, Tyler from the band shared a sweet anecdote about his 2-year-old son before launching into Level Best, a track he wrote for him. They were punchy, yet polished. What I imagine every garage band wish they sounded like. If Queen wanted to do a folksy album, I think it would kind of sound like something Said The Whale came out with. After 30 minutes flew by, Said The Whale were finished. They actually helped tear down their set-up which I appreciated. Some beer, some cheering, a bit more wood puzzle, Mother Mother were on. It was a super climactic opening and it didn’t end there. Starting out with a slower track might seem like an odd choice for an opening track and yet it totally work. It just helped build up the suspense. The crowd was absolutely roaring, the energy was palpable. I will say it right now, Mother Mother are a live band that puts out records. Some bands are more of a studio band that sometimes, they can’t deliver in their live performances. Not Mother Mother. Hearing some of the tracks live breathe new life into the songs. They’re very upfront with the rhythm section which I love in live performances. I’ll pioneer the Rhythm Section Fan Club if I have to. Just some of the stand-out tracks were Monkey Tree, Bottom is a Rock, The Drugs, Let’s Fall in Love. I got to say though, Get Out The Way was where it was at. My notes on that song are just a row of expletives. This seems like a dumb observation as they’re a band but they’re incredible musicians. Like, really incredible. I don’t know what I was expecting but watching them live for the first time was a totally pleasant surprise. 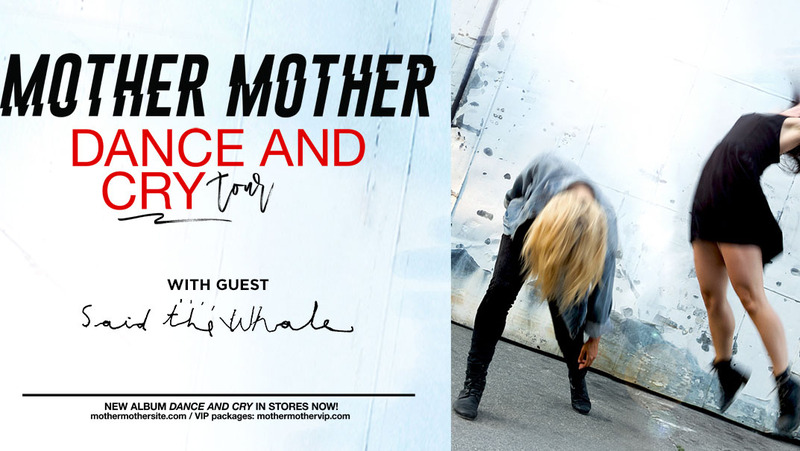 Like Said The Whale, this was a hometown show for Mother Mother. They took the time to thanks fans for their support and referenced where they got their start. Places where they performed open mics like Cafe Du Soleil on Commercial or The Five Points on Main. They even thanked local stations for supporting them over the years. They neglected to mention Evolution but it’s fine, whatever, we’re not that bitter. They later brought out Said The Whale to perform So Down together. It was the ultimate Vancouver crossover. Overall, Mother Mother is a concert you should be at. I can’t wait to see them again. Come dance with me. TL/DR; Oh boy, did you miss a concert. It’s Saturday night. A good 15,000 people were crowding into Pacific Coliseum, come 6:30. People were crowding around the merch desk, looking to grab a t-shirt, others were loading up on overpriced beer. But when concert openers, Lord Huron, took the stage – it all came to a standstill. I will fully admit, I didn’t research them too much before the gig. I figured I knew that one song from 13 Reasons Why (The Night We Met), it’d all be the same sorta vibe, why bother? I was flat out wrong. I was expecting some twinkling, Passenger-y guitar and a banjo thrown in there somewhere. Nope. Lord Huron exploded on that stage. They had it all, crashing guitars, energetic beats, and a freaking Theremin. Every expectation that they would be a folksy, low-key band was right out the window within 8 beats. If A Star is Born was real and Bradley Cooper got clean and sober, he would probably be a member of Lord Huron. When it did get around to The Night We Met, far and away the most gentle song on the set list, it was absolutely gorgeous. I felt like I was at a prom I never got to go to in high school. I will say, and this is absolutely a personal preference, they were a tad bit too country for me. But in terms of warming up a crowd, it’s safe to say we were toasty. They even played for an entire hour, a respectable chunk of time for an opener. Based on that one performance, if you’re looking to check out a new band, you’re going to want to listen to Ancient Names, Fool for Love, and (obviously) The Night We Met. 30 minutes of switching around the stage, I played wood puzzle on my phone, a lot of people went to go drink beer. Saturday Night, after all. The band came out, all dressed vaguely like they were officiating a shotgun wedding in Vegas but they absolutely pulled it off. The Arkells kicked off their performance with Relentless. It was high energy, punchy, and prefaced pretty much the entirety of the show. Oh my God. It was like watching the Duracell bunny. Or if someone just let a box of puppies lose on stage. It was chaos. The good kind. I mean, they had a whole damn brass section. Have you ever been to a concert where you can tell you’re just another crowd, another stage, another night? 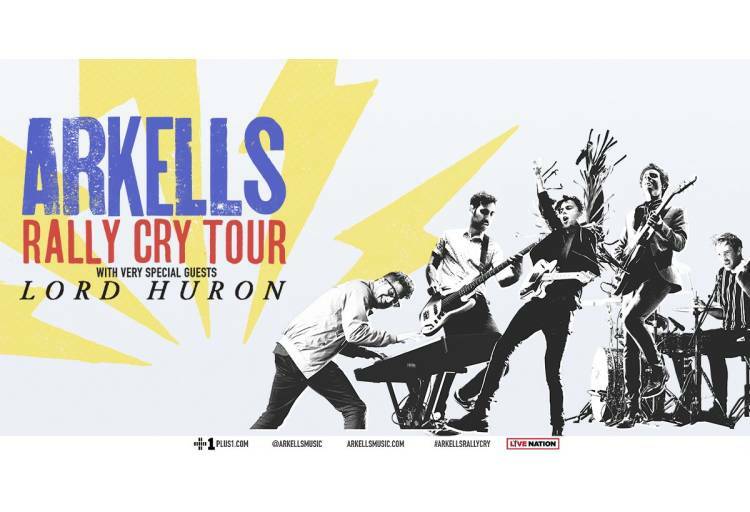 That wasn’t the case for the Arkells. You could tell from every second they were on stage, they appreciated Vancouver and the journey they took to get there. They paid special tribute to the venues they’ve played over the course of their career, The Biltmore Cabaret and The Commodore, in particular. They were a band that looked like they genuinely enjoyed what they were doing. Arkells put on such an incredible show last night, that every attendee needs 24-48 hours of recovery time. Please excuse from work. To clarify, it didn’t work. Do you remember rule two? Dance. Oh, there was some dancing. I have to say it was very Jack Black circa School of Rock meets drunk dad at a BBQ but it totally worked. Everyone was feeding off each other’s energy so even the dorkiest of dance moves were allowed. I will say, if you’ve known me for me than five minutes, you’d know that I hate arena shows. If every band I love could play to a room with a 100-person capacity, I would be a happy camper. Yet, Arkells made Pacific Coliseum feel as intimate as the Biltmore with enough energy to fill up BC Place. I tried noting down the tracks that I felt stood out but I accidentally wrote half the set list. People’s Champ was a banger, Saturday Night was John Hughes-level magic, and 11:11 featured a mashup of ‘Shallow’ from A Star Is Born. A standout moment was the Rally Cry request line. Each night, they have an open spot on the set list. Fans were asked to request a particular song that they loved that may not have made the set list otherwise. They even play the recording of the phone call. It added a personal touch that many other acts don’t offer. Vancouver’s track was Agent Zero, a track they hadn’t played live in over three years. The one thing I did learn is that it is physically impossible to leave an Arkells show in a bad mood. Call me a convert, I’m part of the cult. If you get a chance to get to a show, go. Hell, why aren’t you there right now? Musically, it was all there. Performance was absolutely stellar, and the crowd (Vancouver being infamous for being lukewarm, at best) were lapping it up. Finishing off their set with a cover of ABBA’s ‘Dancing Queen’, one thing I noted was the crowd. It was frat boys doing an interpretation of a waltz, middle aged mom getting down, albeit off beat. There wasn’t an overwhelming demographic. The crowd didn’t have a particular age, or gender, or race. It was just people. Loving music. Together. And isn’t that what every good concert is about? Find Evolution 107.9 in the following places! Launch our player in a new window and listen to Evolution 107.9 now!